An estimated 10,000 ancient Syriac manuscripts have been preserved but fewer than 200 scholars can actually read the language today. A Smith professor and his Mount Holyoke colleague are hoping to change all that through the powers of computer science. 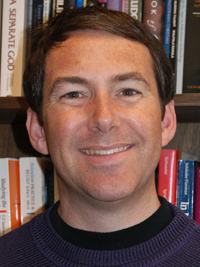 When Smith professor Nicholas Howe’s interests migrated toward deciphering the handwritten words and improvisational scrawls throughout myriad historical documents, the associate professor of computer science didn’t know that his work might some day contribute to improving Muslim-Christian relations. So it goes in our interconnected world. The power of computing is being applied to scholarship in surprising ways that make complete sense once you understand the underlying logic. “I’m a technical guy; I am interested in this because there are interesting technical challenges to be solved,” says Howe. He is talking about his quest to plumb the handwriting of scribes who copiously and laboriously wrote in Syriac, the language of Middle Eastern Christians in the millennium between A.D. 200 and 1200. 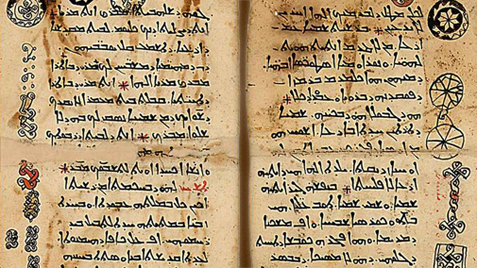 Although an estimated 10,000 Syriac manuscripts have been preserved, fewer than 200 scholars can read the language. One of them is Michael Penn, associate professor of religion at Mount Holyoke College. A big obstacle to delving into this slice of world literature, he explains, is that most manuscripts are undated, giving us little idea when they were penned or by whom. This is vital information to any historian trying to navigate these documents. Without some help from machines, most of these writings would remain inaccessible for decades or even centuries to come. This illustrates one step in the processing sequence for deciphering handwritten words that Smith computer scientists have developed. The top row contains samples of the letter alaph taken from different manuscripts. When the letters are stacked up and computed to the average, the result is the fuzzy image on the right. However, once a mathematical transformation is applied to each sample, the letters are brought into better alignment. The results are shown on the bottom row — the transformed samples on the left and the resulting average on the right. The average aligned image can be thought of as the idealized form for alaph, and any differences between an individual transformed sample and the ideal are indications of the scribe's characteristic writing style. Penn and Howe found each other through a mutual friend. Some of Howe’s previous work involving George Washington’s letters had sensitized him to issues involved in using computers to examine handwritten documents. Howe invited Penn for dinner and they soon realized that if they could apply Howe’s interest in character recognition to exploring the idiosyncrasies of the handwriting in Syriac manuscripts they could begin to offer up clues with which to date them with considerable accuracy. Howe is approaching this project using principles that go back to his dissertation research on image retrieval in which a computer learns, for instance, what a bicycle looks like and then looks for bicycles in thousands or even millions of other images. It is a programming challenge that involves machine learning. “The best way to learn what a bicycle looks like is to give the computer thousands of examples of bicycles, rather than saying it is two circles connected by some rods,” said Howe. When it comes to handwriting recognition he wants to be able to teach a computer how scribes were forming marks on the page during different time periods by giving examples and letting the computer figure out how they differ. The fruits of this research could have important implications for understanding how Christians and Muslims regarded each other when Islam was still a young religion. Most of what we know about early Christian/Muslim interactions comes from Latin and Greek texts. As a result, Penn argues, we have a distorted view of how followers of the two faiths first responded to one another. Syriac-speaking Christians lived among Muslims as the new religion started to spread, says Penn. Their perspectives differed from those of Christians in modern day Istanbul, for instance, where many of the Greek texts emanated and where they had been fending off Muslim invaders for centuries. Similarly, Latin texts often reflect the perspectives of Crusaders at war with the Muslim world. What if this project really does lead to a renewed sense of common historical purpose among Christians and Muslims? “That would be wonderful,” said Howe. The promise of Howe and Penn’s collaboration goes beyond analyzing Syriac. 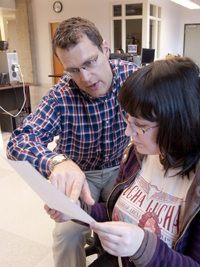 With some tweaking, the algorithms Howe is developing could, if this concept proves to be successful, apply to any number of languages in which archives of handwritten documents exist. Because handwriting evolves and shifts in discernible ways over time, analyzing script is a common way for historians to situate ancient manuscripts in time and place. Someday, they hope, online databases of images from known materials in such languages as Arabic, Sanskrit, Chinese, Latin and Greek will contain enough material that a scholar anywhere in the world will be able to scan a few pages of whatever he or she is working on and within minutes receive rich data on what it might be similar to.